The last day of my trip (officially) was the same as the half marathon. After soaking a bit in the room, I headed out to Disneyland Park to finish up my time and try to make the most of it that I could. I was seeing World of Color that evening, and had made a lunch reservation at Carthay Circle Lounge so that I could have the preferred seating (more on that later). It was an early lunch (noon), and I didn't want to eat at that point, so I called the dining line at around 10:30 from my room and was able to move the time back to 3:30. That was nice, as they were full at 3:30 and not taking anymore reservations. To save some walking, I went to Downtown Disney and took the monorail into Disneyland. I hadn't used that at this point; but was hoping for more of a leisurely day in case my feet did decide to hurt instead of just being a bit sore. As soon as I was off the monorail, I beelined to TinkerBell. I wanted to make sure I got a picture with her and wasn't sure if she'd be leaving for a parade, or how long the line was. I waited about 45 minutes. Which, considering I've waited for other characters that long (again, Disney Nerd), wasn't that bad. Other adults were in line with their medals and/or official running shirts. I didn't wear my medals, but instead packed them in my bag. I didn't want them to scratch by clinking together, so I only took them out for the pictures. Some people wear them around, and rightfully so (they should be proud), but I didn't do that. I didn't want them to scratch, mostly. Of course, I think there is a limit. Someone on the plane ride back to my home state was wearing hers. Honestly, it was a day after the race, and you were no longer in Disney - it could have gone in your carry-on. But, to each their own. Back to TinkerBell. I was able to meet with her and Iridessa - separately. 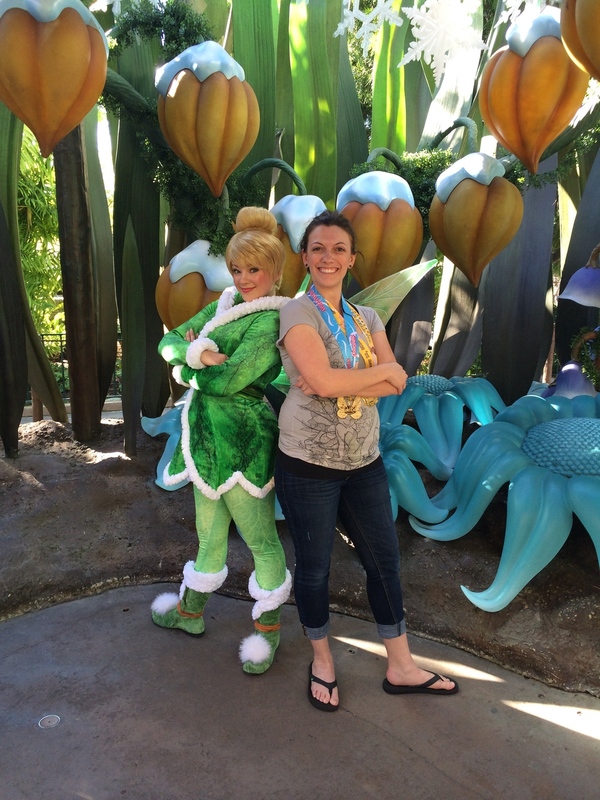 Tink was very helpful in taking some fun pictures. 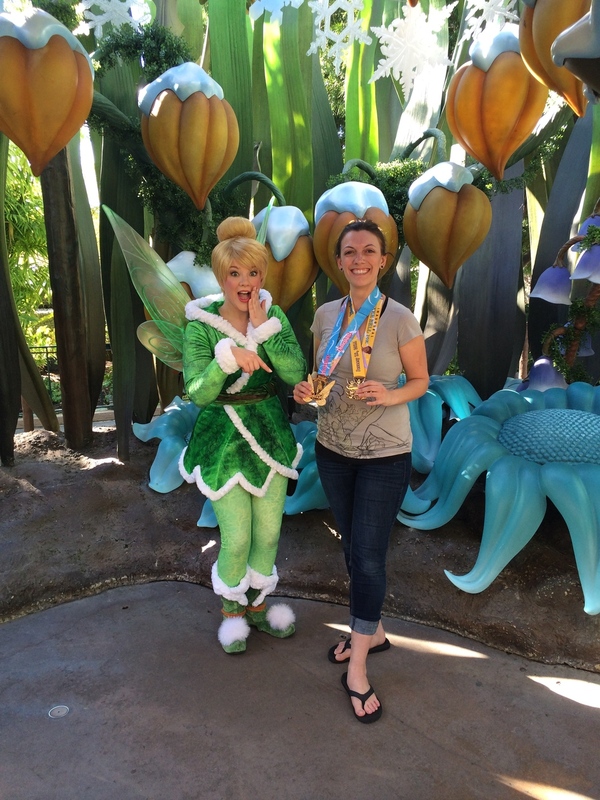 Tink liked the half marathon best, because it only had her on it. Of course, she likes to be the center of attention. And she was this weekend. She also commented how she liked my hair (also in a top bun, like her). I moved onto Iridessa and we enjoyed looking at the medals, too. 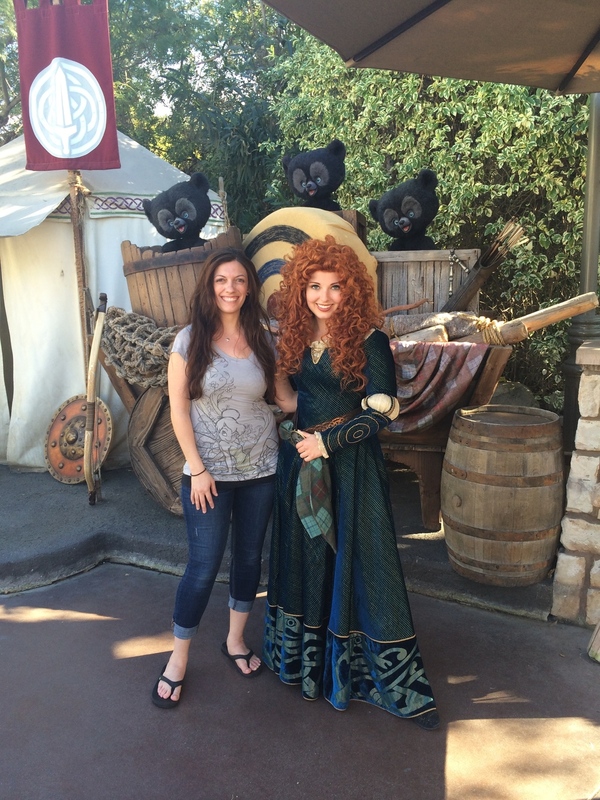 I packed my medals away and headed over to where Merida was supposed to be to see if I could get a picture with her. It wasn't a very long wait at all. We discussed running, and how I would like to take up her sport, archery. Continuing around the Magic Kingdom, I went on Haunted Mansion and Pirates of the Caribbean. I missed going on Indiana Jones this trip. It was closed every time I went by because of the ride being down, and with having to manage times for reservations and other fastpasses, I couldn't go. It's alright, I'll be back in August. That was all the time I had at the Magic Kingdom since I had to move onto California Adventure to get my dine on. I said goodbye to the Castle, since I would not be seeing it again this trip, and headed into the corridor to make it to my reservation. I was at the park a little early, so managed to take a picture with a Dapper Dippity Dog and Pluto before heading into the restaurant. I checked in at Carthay early, but still didn't get seated for about 20 minutes. I was upstairs in a balcony area overlooking the square below. I could see the Trolley and some activity. It was a nice view and atmosphere. There was a large group of ladies eating behind me, but I didn't figure out it was Patty of Margaritas, Miles & the Mouse and some other Disbroads until they stood up to leave (I recognized Patty). I didn't say hi as they were already heading out the door. This was a nice relaxing meal, and worth the cost because of the World of Color Premium viewing ticket. 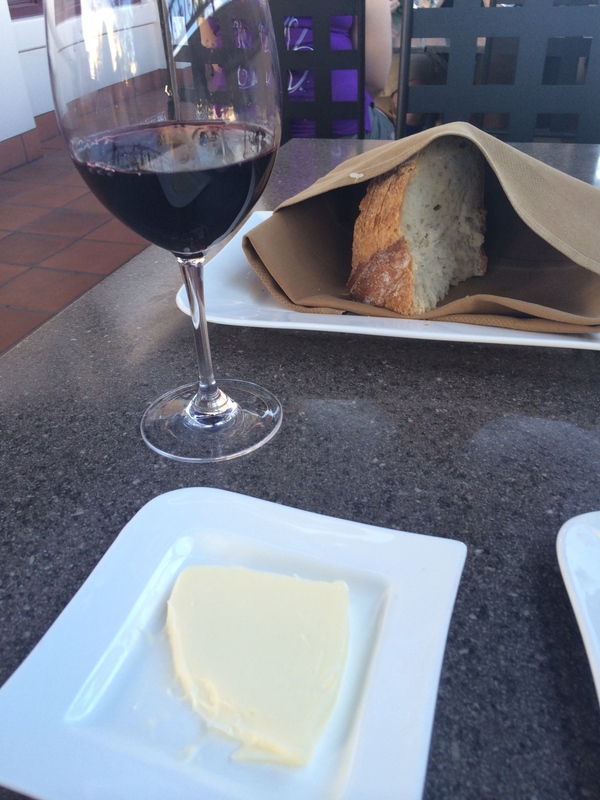 I asked the cast member to bring me a glass of wine of his choice that would go with my meal (the burger), and I sipped on some red wine and ate wonderful bread. I also ordered, in addition to the flat cost for the world of color viewing menu, off the regular menu. I picked up some "biscuits" (balls of bread) stuffed with white cheddar, jalapeno and bacon. They were also served with an apricot honey butter. These were amazing. I need to eat here when I'm not using the World of Color plan, so that I can get other items off the regular menu. I didn't take a picture of my meal. I think my battery was running low. Or I just forgot. It was enjoyable. However, it made me sleepy. Food usually does. And I did run 13 miles that morning. After finishing up, I headed back to the resort to get my nap on, and rest up for World of Color that evening. It's nice having a resort so close to the area. Paradise Pier was wonderful, but I do plan on staying at the Grand Californian for Dumbo. That'll be even better in respect to seeing World of Color by walking out the door into the park. After I rested, I returned to the park about an hour and a half before the show was to start. I wanted to get there early to get a good spot. I ended up walking in about an hour before and sitting down on a top step near a railing. That was nice, as my view would be unobstructed once I stood up. 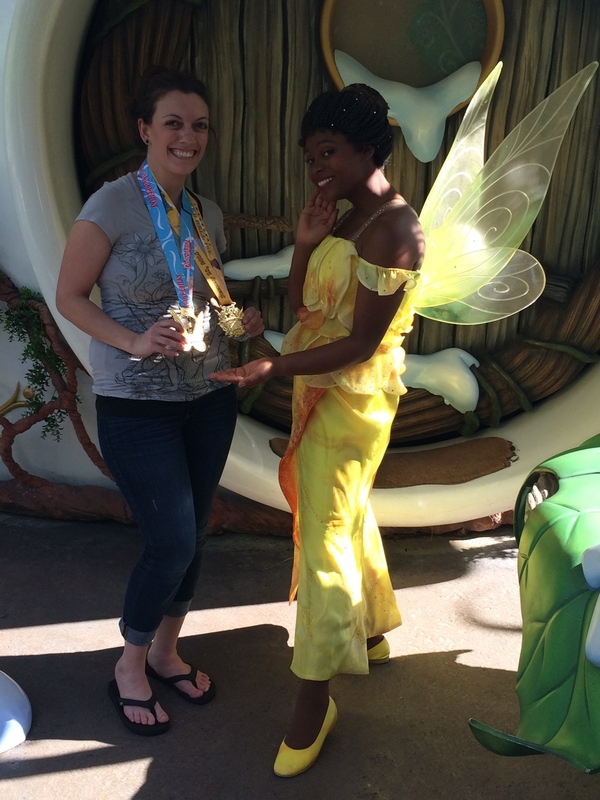 I met a family that had a love for Disney, had ran the races, and was wearing Lululemon, too. I had actually changed back in my room, and good thing, as it was chilly. Long sleeves and pants were required for this viewing. I can't even describe how wonderful World of Color was. Thirty minutes of pure magic. Disney really hit the spot here and I think Walt would be proud. Almost made me cry how wonderful the show was. I hope everyone who loves Disney gets to experience it. I also hope they somehow bring it to Florida! The music, the visual, the atmosphere, it all just added up to the perfect ending to my trip. It was hard to say goodbye, but at least I knew I'd be coming back once again this year. Will definitely be seeing World of Color once (or twice!) again. Goodbye Disneyland, See you in August.